Cloud storage is a critical component of cloud computing, holding the information used by applications. Big data analytics, data warehouses, Internet of Things, databases, and backup and archive applications all rely on some form of data storage architecture. Cloud storage is typically more reliable, scalable, and secure than traditional on-premises storage systems. AWS offers a complete range of cloud storage services to support both application and archival compliance requirements. Select from object, file, and block storage services as well as cloud data migration options to start designing the foundation of your cloud IT environment. and analyzes the Total Cost of Ownership for AWS cloud storage. What's New in Storage at AWS? Amazon Elastic Block Store (Amazon EBS) provides highly available, consistent, low-latency block storage for Amazon EC2. It helps you tune applications with the right storage capacity, performance and cost. EBS is designed for workloads that require persistent storage accessible by single EC2 instances. Typical use cases include relational and NoSQL databases (like Microsoft SQL Server and MySQL or Cassandra and MongoDB), Big Data analytics engines (like the Hadoop/HDFS ecosystem and Amazon EMR), stream and log processing applications (like Kafka and Splunk), and data warehousing applications (like Vertica and Teradata). For more information visit the Amazon EBS page. Amazon Elastic File System (Amazon EFS) provides a simple, scalable, elastic file system for Linux-based workloads for use with AWS Cloud services and on-premises resources. It is built to scale on demand to petabytes without disrupting applications, growing and shrinking automatically as you add and remove files, so your applications have the storage they need – when they need it. It is designed to provide massively parallel shared access to thousands of Amazon EC2 instances, enabling your applications to achieve high levels of aggregate throughput and IOPS with consistent low latencies. Amazon EFS is well suited to support a broad spectrum of use cases from lift-and-shift enterprise applications, big data analytics, web serving and content management, application development and testing, media and entertainment workflows, database backups, and container storage. For more information visit the Amazon EFS page. Amazon Simple Storage Service (Amazon S3) is object storage designed to store and access any type of data over the Internet. It is secure, 99.999999999% durable, and scales past tens of trillions of objects. S3 is used for backup and recovery, tiered archive, user-driven content (like photos, videos, music and files), data lakes for Big Data analytics and data warehouse platforms, or as a foundation for serverless computing design. For more information, visit the Amazon S3 page. Amazon FSx for Lustre is a fully managed file system that is optimized for compute-intensive workloads, such as high performance computing, machine learning, and media data processing workflows. With Amazon FSx, you can launch and run a Lustre file system that can process massive data sets at up to hundreds of gigabytes per second of throughput, millions of IOPS, and sub-millisecond latencies. Amazon FSx for Lustre is seamlessly integrated with Amazon S3, making it easy to link your long-term data sets with your high performance file systems to run compute-intensive workloads. For more information, visit the Amazon FSx for Lustre page. Amazon FSx for Windows File Server provides a fully managed native Microsoft Windows file system so you can easily move your Windows-based applications that require file storage to AWS. Built on Windows Server, Amazon FSx provides shared file storage with the compatibility and features that your Windows-based applications rely on, including full support for the SMB protocol and Windows NTFS, Active Directory (AD) integration, and Distributed File System (DFS). Amazon FSx uses SSD storage to provide the fast performance your Windows applications and users expect, with high levels of throughput and IOPS, and consistent sub-millisecond latencies. This compatibility and performance is particularly important when moving workloads that require Windows shared file storage, like CRM, ERP, and .NET applications, as well as home directories. For more information, visit the Amazon FSx for Windows File Server page. 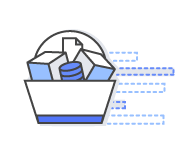 Amazon S3 Glacier is an extremely low-cost and highly durable object storage service for long-term backup and archive of any type of data. S3 Glacier is a solution for customers who want low-cost storage for infrequently accessed data. It can replace tape for media and entertainment applications, and assist with compliance in highly regulated organizations like healthcare, life science, and financial services. For more information visit the Amazon S3 Glacier page. AWS Backup is a fully managed backup service that makes it easy to centralize and automate the back up of data across AWS services in the cloud as well as on premises using the AWS Storage Gateway. 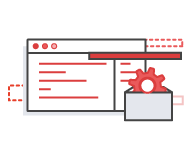 Using AWS Backup, you can centrally configure backup policies and monitor backup activity for AWS resources, such as Amazon EBS volumes, Amazon RDS databases, Amazon DynamoDB tables, Amazon EFS file systems, and AWS Storage Gateway volumes. AWS Backup provides a fully managed, policy-based backup solution, simplifying your backup management, enabling you to meet your business and regulatory backup compliance requirements. For more information visit the AWS Backup page. The AWS Storage Gateway is a software appliance that seamlessly links your on-premises environment to Amazon cloud storage. It offers local storage with highly optimized connectivity to AWS Cloud storage, and helps with migration, bursting and storage tiering use cases. Replace tape automation without disrupting existing processes, supplement on-premises workloads with storage capacity on demand, or augment existing on-premises storage investments with a cloud tier. For more information visit the AWS Storage Gateway page. Amazon offers a portfolio of data transfer services to migrate data into and out of the AWS cloud. These services help you do things like securely and quickly move multi-petabyte archives, accelerate network transfers with existing infrastructure, and capture continuous streaming data from multiple sources. For more information visit the Cloud Data Migration page. AWS Marketplace sellers offer hundreds of industry-leading products that are equivalent, identical to, or integrate with existing storage products in your on-premises environments. These offerings complement the existing AWS services to enable you to deploy a comprehensive storage architecture and a more seamless experience across your cloud and on-premises environments. AWS Storage Competency Partners leverage AWS solutions including Amazon EBS and Amazon S3 to provide secure and efficient storage solutions for running primary workloads in the cloud or extending an on-premises solution to create a hybrid architecture.. Learn how AWS and APN partners have helped organizations like EidosMedia and HUSCO implement efficient and cost-effective primary storage solutions.